Whangateau is peaceful and tranquil, but there is plenty to do if you want to get out and about in the local area. 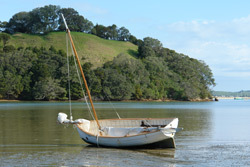 Launch your boat nearby when the tide is in and explore Whangateau Harbour and beyond. 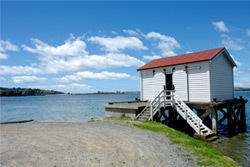 The Hauraki Gulf with its many islands is right on your doorstep. Just a few minutes up the road in Leigh is the Goat Island Marine Reserve where you can go snorkelling, kayaking and swimming. 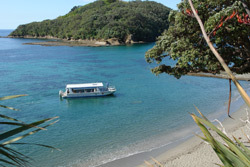 At Goat Island you can also take a trip on the Glass Bottom Boat and see the underwater world like never before...and the Marine Discovery Centre run by AUT is open to the public. Another "must see". Enjoy the surf at Pakiri, Leigh or Omaha Beaches or sheltered swimming at Matheson Bay and in our beautiful harbour. For land-based pursuits, visit the Reptile Park at Ti Point and see local and exotic reptiles up close – including New Zealand’s living dinosaur, the Tuatara or visit the Sheepworld Farm Park near Warkworth and experience New Zealand farming. On Saturday morning there is a Farmers Market and Craft Market in the local township of Matakana. Any day of the week you can play a round of golf, visit art galleries, see pottery being made, go wine tasting, watch a movie at the cinema in Matakana or enjoy local walking tracks. There are many excellent restaurants and cafés nearby in Leigh, Point Wells, Matakana, Snells Beach and Warkworth. To get around, you can call Matakabs – eco-friendly taxis that service the Matakana area. We have lots of information and brochures on local activities at the holiday park office.